How many times have you and your partner asked each other, “what do you want to do?” only to pass the usual ideas back and forth? Do you end up having dinner at the same restaurant you always go to and watching a movie you both don’t really want to see? Perhaps it’s time to try reigniting the spark you had when you first started dating. Do something unique on date night, instead of sitting in a no-talking-permitted theatre. Here are five unique date night (or day) ideas. Rather than dragging yourself to a restaurant you’ve been to before, why not have a romantic three course meal at home? Maybe it’s not so unique but if it’s something you haven’t done before, that will make it special. Catering companies like Noosh Catering will go to great lengths to give you exactly what you need to make the night special – all in your own house! You could also attend a tasting – wine, cheese or chocolate, for example – or go on a culinary tour. You’ll both have plenty to talk about – try and be descriptive. One-word answers like ‘yum’ or ‘yuck’ don’t lead to scintillating conversation! Giving back to the community is a great way for you and your date to feel more connected. There’s so many things you can do – serve food at a homeless shelter, spend time with the elderly, work with animals or cheer up sick kids. With so many possible activities you can engage in, pick something that is meaningful and close to your hearts. Knowing that you’re both making a difference in the lives of others will give the two of you a sense of togetherness. There are poetry nights at various coffee houses, bookstores and bars. Open mic nights give amateur poets a few minutes to test out their work on an open-minded audience. Hearing the heartfelt words of others will likely draw out all kinds of emotions from you both. When you’re both feeling brave, perhaps you can give it a go and write a poem to dedicate to one another. This is an activity suited to those who have been together long enough to get sappy! You can both bond over a new activity that neither of you have done before. Take a class together! Painting, dancing, yoga, pottery. It’s not only exhilarating to learn something new, but it starts you both on equal footing, which is always good in a relationship. It’ll give you something to look forward to each week and something to talk about in between classes! Perhaps the city or town where you live doesn’t seem so exciting anymore. Maybe you’re one of those people to whom your own city is pretty much a mystery. Beat this problem by exploring it through the eyes of a tourist. Visit the places tourists would go – museums and galleries, historical landmarks, eateries and so on. 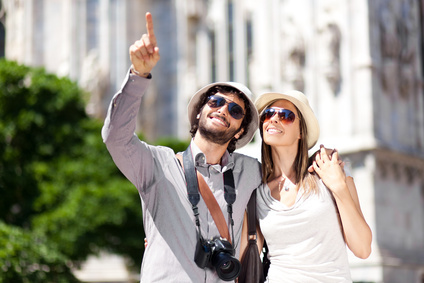 Looking at your city through fresh eyes can freshen up your relationship too! With so many things to do, it’s possible to steer away from your usual yawn fest of dinner and a movie. It just takes a little creativity from you both and the ability to think outside the square. Start with these ideas, and before long, you may be able to come up with even more unique date ideas. Thought of any yet?